I love getting in the fall spirit by decorating my walkway for Halloween! It’s welcoming to friends and family who come over, a way to express creativity, and inviting to trick-or-treaters on Halloween. And if you’re a big Disney fan like me, it’s a great way to show your love for all things Disney. I personally like pumpkin ideas that don’t involve the mess of carving, so the last couple of years have done different painted pumpkins. This year, I decided to paint four pumpkins like the Disney Parks walls famous among Instagram: The blue wall and Small World wall at Disneyland Resort, and the Bubblegum wall and Purple Wall at Walt Disney World. Lay out trash bags or newspapers to paint your pumpkins on. Squirt a large amount of each paint color on a paper plate, and gather a cup of water to rinse your brushes between colors, and brushes. Place painters tape around the base of each of your stem, so that you don’t get pain on them. 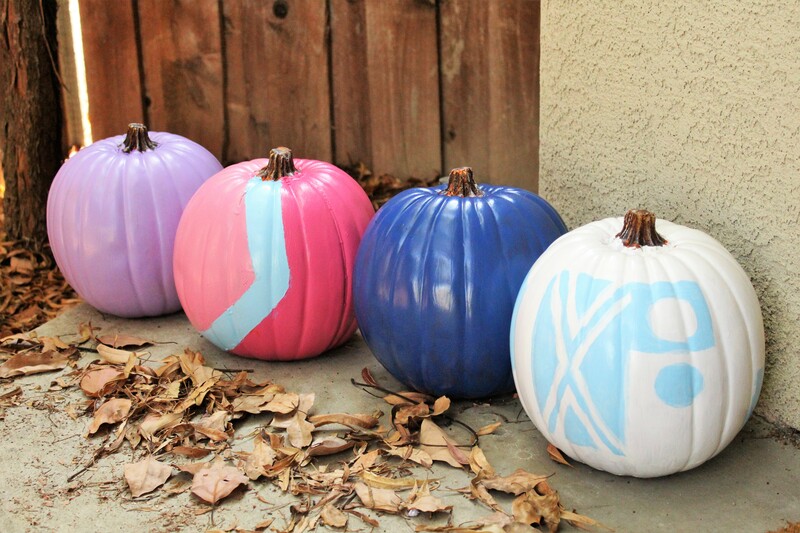 Paint one pumpkin a solid blue color, and one pumpkin a solid lavender color, and one pumpkin a solid white color. Let them set to dry. Once dried, they will most likely need a second coat of paint. Once they’re dry you can remove the tape from your pumpkins. For the Small World Wall pumpkin, once dry, use light blue paint with your medium brush to paint circles, triangles, and other various patterns that can be found on Small World. For your Bubblegum Wall pumpkin, place two long pieces of painters tape to make an angle pointed to the right, stretching from the top to the bottom of the pumpkin. You will need two of these angles, with about 4-5 inches in between them. Paint one side two coats of light pink, and the other side two coats of hot pink. Remove the painters tape from the Bubblegum Wall pumpkin and pain the in between blank space light blue. Let set to dry and then remove the tape from pumpkin. Now your pumpkins are ready to enjoy to decorate your walkway and take pumpkin selfies with!